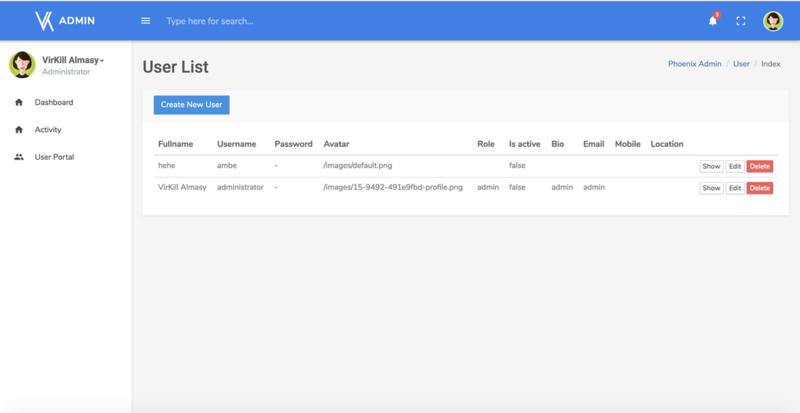 Phoenixadmin , fastest way to scaffold admin panel in phoenix framework. Creating backend admin portal is almost a routine thing to do for many projects. Instead of spending hours to build user authentication and everything, it can be setup in 3 minutes. Phoenix make it easier for us to create crud application with its generator. However after a while, the generator felt too basic. It is up to us to modify it as our will. However, unlike the customer facing web applciation, most of the time backend admin portal is not really need to follow some design, as long as it is readable and follow common design style such as material design, it is generally acceptable. In phonix world, out of the box, it is already super easy to generate CRUD html interface. Even further, there are several library we can use to achieve similar effect as built in django admin in python world, or RailsAdmin in ruby world such as Ex_admin and recently Torch. If you need it as a library in your dependency, they can be added. The later one will give nicer html output.